A timely cri de guerre—or perhaps antiguerre or autre guerre—from a distinguished student of liberalism and its enemies. World Policy Institute fellow Berman (A Tale of Two Utopias, 1996, etc.) locks horns with Samuel Huntington’s once ignored but now widely cited “clash of civilizations” thesis, which pits the Islamic against the Western world. The terms are a little off, he argues, especially given that “in all of recent history, no country on earth has fought so hard and consistently as the United States on behalf of Muslim populations—a strange thing to say, given what passes for conventional wisdom.” Why, then, after our efforts in defense of Islamic Kurds, Islamic Marsh Arabs, Islamic Bosnians, and Islamic Kosovars, do Islamicists and terrorists hate Americans so roundly? Perhaps, Berman writes, the battle is not so much between Islam and the West as it is between different strains of Western thought that have been transported around the world: “the totalitarian cult of death” and the classically liberal view of freedom and of free people. That’s not such a strange thesis, given that “an amazing number of the Arab and Muslim terrorists turn out to have second and even primary identities as Westerners,” among them the suicide warriors of 9/11, who schooled in Germany, Belgium, England, and the US and had little evident desire to use their energies at home. (The author notes in passing that members of Osama bin Laden’s immediate family do business today with George Bush the Elder.) 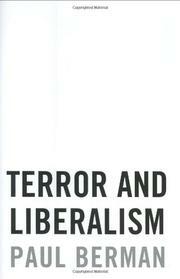 Ranging from Camus to Lukacs to Marx to Arafat, Berman explores these conflicting ideologies and their implications, finding time to insert a few kind words about the current president’s successes in Afghanistan and to urge his fellow liberals on in the war against fascism, whatever its other names. “Some aspects of a war against totalitarianism and terror can be fought even by people who cannot abide George W. Bush,” he argues. Full of good, smart moments, even if its governing idea is tough to pin down.